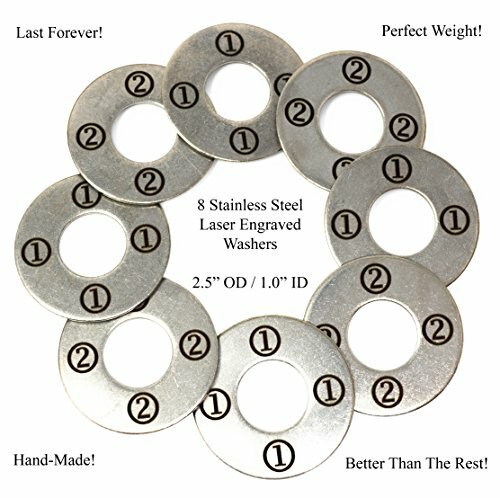 This is a set of 8 laser engraved stainless steel washers for tossing and pitching. Engraving is done on both sides and clearly distinguishes one competitors washers from the others. Their outside dimension is 2.5". Their inside dimension is 1.0". They are the standard size, weight, material, and dimensions demanded by competitive washer players and are the type required to be used at the biggest tournaments around the world. They come in a medical grade polypropylene resealable container so that they stay together and secure between uses. Because they are made of stainless steel, they do not rust. Buy the best & forget the rest! STANDARD SIZE & WEIGHT: Perfect for Beginners, Competitive Players, & Tournaments - 2.5" OD, 1.0" ID. All Washers In Set Are The Same Weight. LASER ENGRAVED: 8 Stainless Steel Washers Laser Engraved On Both Sides To Distinguish Player 1 and Player 2. SUPERIOR MATERIAL: Stainless Steel Washers Won't Rust, Break, or Chip Like Coated, Painted, or Plastic Washers. Buy The Best & Forget The Rest! AMERICAN HAND-MADE: Designed, Manufactured, and Sold in America by an American Family! If you have any questions about this product by AirstreamIT, contact us by completing and submitting the form below. If you are looking for a specif part number, please include it with your message. 4 Black/4 White Powder Coated Replacement 2-1/2" Washer Toss Pitching Game Washers - High Gloss! 4 Blue/4 Red Powder Coated Replacement 2-1/2 Washer Toss Pitching Game Washers - High Gloss!